Two DP70 (817+825) from Plaza, Auckland via Cinerama theatre. Newly restored cinema built in the 20's. Reported closed 1998. Now a concert venue. Two DP70 (1854+1890) with Strong xenon from Plaza, Auckland. Opened 1929 Very large cinema. Reported closed 1998. Now a concert venue. Four DP70 (817+825+1854+1890). The first Todd-AO theatre in New Zeeland. Opened in 1958 with "South Pacific". DP70 817 & 825 was moved to the Civic, Auckland because a shipping strike delayed the arrival of DP70 1854+1890. The Plaze got DP70 1854 & 1890 instead when they finally arrived. One DP70 (1854+spares from 1361+1890). 1854+1890 from Hollywood Cinemas. Two DP70 (1854+1890) in storage. Machines sent to the Hollywood in Sumner. Two DP70 (2206+2209). DP70 from State, but not used for 70mm. Closed mid October 1993. Two DP70 (2206+2209) installed for "South Pacific" 06.08.1959. DP70 moved to Savoy. 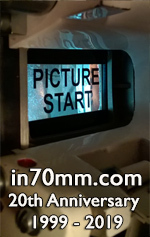 A classic photo that demonstrates better than any other photo I've seen, the robustness and stability of the mighty DP70 projector. This photo was taken after the severe earthquake that hit the New Zealand city of Christchurch a few years ago. It truly is a case of a picture is worth a thousand words !!! 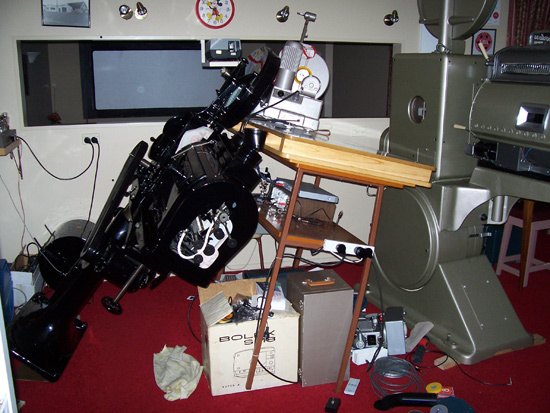 The other projector in the photo is an Ernemman 11 projector. 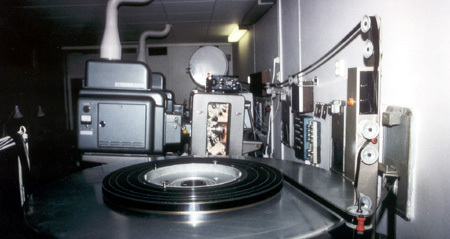 Photo taken in the projection room of a private home cinema. Two DP70 (2493+2494). Theatre rebuilt and machines removed to Hoyts store in Auckland for spares. Possibly moved to Top Town Cinema in Blenheim. 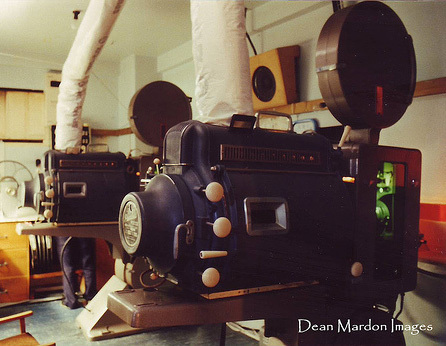 Graeme Edwards bought these machines when the OCTAGON closed in 1992 and moved them to the WESTEND CINEMA Hastings where they were used for about 12 months before I built the mutliplex and closed the cinema. They were like new (having done only 2 sessions per day since installation-a few extra sessions in holiday) and I sold them to a private collector complete with 70mm lenses, soundheads etc. Two DP70 (2493+2494) from Octogan, Dunedin. Hastings where they were used for about 12 months before I built the mutliplex and closed the cinema. Sold them to a private collector complete with 70mm lenses, sound heads etc. Two DP70. 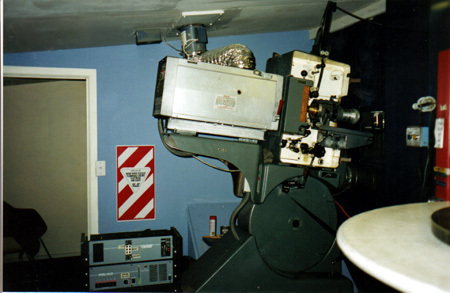 One DP70 from the Hoyts store in 1991. 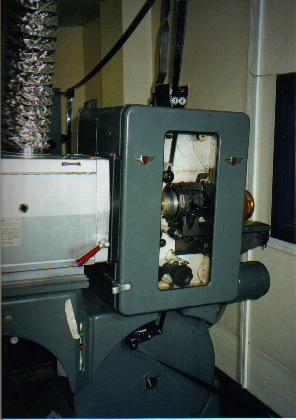 This machine went to a private collector when the cinema closed for conversion into a multplex in 1994. One DP70 which came from the Hoyts store in 1991... it's partner went to Graeme Edwards. Two DP70. Penthouse, Brooklyn (Still in use) The units in Palmerston North were second-hand from Sydney. Three DP70 (1559+1854+1890). 1359 is the last DP70 operating in Christchurch. Two DP70 (1854+1890) only in storage and never ran. #1854 purchased by Ian Fisher (Christchurch) in March 2009. #1890 has now been dismantled and Ian Fisher now have most of these parts. Machine dismantled August 2010 and purchased by Ian Fisher (Christchurch) and Ian Fisher now have most of these parts. Two DP70 for "South Pacific" 02.12.1959. Two DP70. 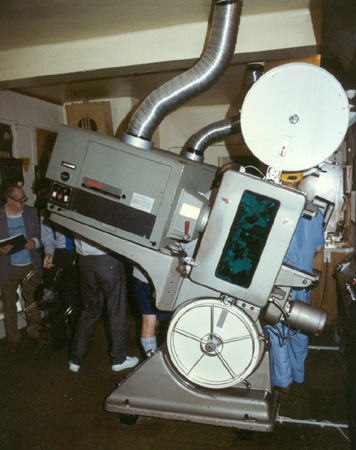 Named changed to Cinerama 19.08.1966 with single lens Cinerama. Demolished 1987. Is this cinema in New Zealand? Unusual recent combo. DP70 with Dolby Digital Reader. Unusual to see with Xenith lamphouse, Kinoton platter. There were only 7 new pairs brought into NZ (Cinerama, Plaza Akd / Cinerama & Kings Wgtn / Cinerama & Plaza ChCh / Octagon Dunedin. There was a pair at State Palmerston North when it closed but not sure if they were brought in later by Ray Bullen xHoyts Australia – they went to Penthouse. City DP70s went to Napier (2), Hastings (xOctagon), Blenheim (they had strong lumex), Sumner & collections. I think Peter McQuarters @ Ashburton has one – he definitely has the Vic X from Avon. Try Ray Bullen – looks too smart for Sumner. If in NZ, would need to be Nelson or Palmerston North - but Ray always used acoustic tiles with holes on the walls of the bio - so not them. Bio is quite recent, especially with Digital Reader (1990s). These are first generation Cinemeccanica lamphouses – NZ had more the blue Zenith lamphouses in various sizes. I thinks Cinemas 1 & 2 had the pictured lamphouses and they went with projectors to Paramount Wgtn. Not sure if there were anymore … maybe Westend, Embassy Wgtn.